We thought we’d have fun with our clickbait headline, but cutting weight is no laughing matter. As Andrew Stelzer reports, athletes in combat sports sometimes go to extreme lengths to rapidly lose weight leading up to the weigh-in. Then, having made the contracted limit, they try to pile the weight back on in the 24 hours before the match. As you might expect, this is unhealthy, leads to poor performance, and can even be deadly. The idea is to fight at the lowest possible weight class, preferably one significantly below what you actually weigh when the bout begins. But since it’s common for both contestants to be cutting weight, they’re usually risking their health without gaining a competitive advantage. Imagine how much better the sports would be if the athletes were climbing into the ring or cage in peak physical condition, rather than drained by the weight-cutting routine. 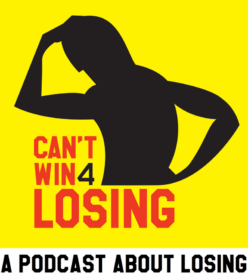 Stelzer interviews fighters in various disciplines, as well as health experts and sport officials about how combat sports can solve this problem. 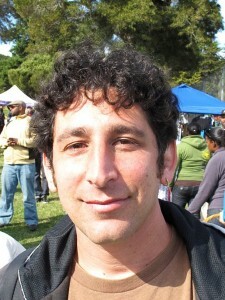 Andrew Stelzer is a journalist in Oakland, California. 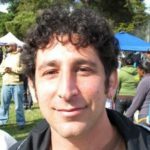 You can hear more of his work at AndrewStelzer.com. 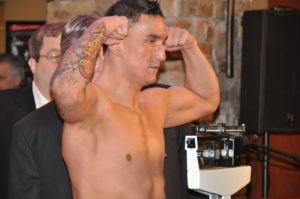 Weigh-in photo by Peter Gordon (CC by 2.0). Stelzer photo courtesy Andrew Stelzer. 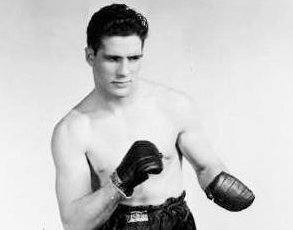 Billy Conn was light heavyweight champion of the world in the late ’30s and early ’40s. He was in the inaugural class of the Boxing Hall of Fame, and the Associated Press ranked him as the ninth best pound-for-pound fighter of the 20th century. On top of all that, he had Irish charm and Hollywood looks. But all anyone outside of Pittsburg remembers about Billy Conn is a fight he lost. It was in 1941, and he had moved up in weight to challenge heavyweight champ Joe Louis. Conn was such a hero in Pittsburgh that the Pirates baseball game was suspended for 54 minutes so the crowd at Forbes Field could listen to the fight over the loudspeakers. For 12 rounds at the Polo Grounds in New York, the Pittsburgh Kid had the Brown Bomber beat. But then he decided it wasn’t enough to beat the great Joe Louis. He wanted to be the guy who knocked out the great Joe Louis. Tim Conn helps tell the story of his father’s moment in the spotlight, and the 50 years he spent reliving it, including his long friendship with Louis. Biographer Andrew O’Toole, author of Sweet William: The Life of Billy Conn , discusses Conn’s legacy as well. There are two Billy Conn biographies. Sweet William: The Life of Billy Conn by Andrew O’Toole, who you can hear in this story, and Billy Conn – The Pittsburgh Kid by Paul Kennedy. In the words of the subhead: This is the story of Billy Conn, who won the girl he loved but lost the best fight ever. Not many photos, but they’re great. BillyConn.net — Plenty of photos, and lots more, at the family’s official site! This AP obit of Conn is pretty straightforward, but it does include a great story from late in his life when he punched out a robber in a store. The Red Smith column mentioned in the story. The song that plays throughout the story about the Billy Conn-Joe Louis fight is “The Pittsburgh Kid” by The BibleCode Sundays. They are a band from London who gave us permission to use their song about the great light-heavyweight who almost beat the Brown Bomber. Thanks to Andy Nolan for that. The BibleCode Sundays’ new album is called Walk Like Kings . It includes guest appearances by Russell Crowe and Declan MacManus, the older brother of band member Ronan MacManus. You might know Declan by his stage name, Elvis Costello. The BibleCode Sundays are on tour in the U.K. for the rest of 2017. Both used under the Creative Commons CC by 3.0 license.